Joan Edelstein's scarves are made with bits of fabrics and fibers, both natural and synthetic (but NO WOOL). Watercolored silk borders frame the piece, then the pieces are assembled on her worktable, along with ribbons, metallic trims, vintage and unusual pieces, to be sewn in place with a very strong twisted thread. Pull on them, they will not break, but you still have a feminine and delicate scarf to accent your outfit elegantly! Nice for a light touch, truly a piece of art to drape around your neck, head, or jacket. Made in Joan's Arts & Passions Studio in Texas. This is part of Joan's "One Woman's Treasure" collection, honoring the snips of fabric and fiber that some would throw away, but here become captured gems. The border is deep turquoise blended into violet dyed silk. Purple thread joins the overlapping brightly colored fabric bits, tasseled multicolor yarn also winds down the center with a hint of metallic glitter. This is part of Joan's "Melange" collection, a beautiful assortment of colors and designs, a pastiche to wear with style. 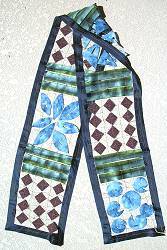 The border is vibrant turquoise blue and leafy green dyed silk. Orange thread joins the the long stripes of periwinkle indigo silk stretching the center length of scarf. On one end is a magenta horizontal piece defining the scattered geometric bits in prints of black-and-white, lemon-lime and denim blue a metallic red thread winds through it all. The other end has a sherbet horizontal bar defining the bit of glamour girl, printed sign "God watches us at all times, Let's try to be entertaining", butterfly and feather and fabrics in fuchsia, black, golds and oranges, a metallic gold/black thread winds through it all. This is part of Joan's "A Finer Madness" collection, where creative whimsy and tradition collide. The border is jet black dyed silk. Mustard gold thread joins the pieces to the border. Distinctive sections are divided by a trio of silk bars in watery fern/leaf/lagoon greens. There are sections of squares in tonal brown scrolling print fabric, and sections of leaf, triangle and circle shapes in muted light denim blue print with cutout details. About 60 x 8 inches, great size for tying at neck, draping over jacket collar or shoulders, wrapping around head! Watery dyed silk border, textural threads and yarns are joined by grid of sewn threads. This is part of Joan's "Roots" collection. The border is vibrant red/orange, green and plum purple. The yarns are fuzzy and thready in colors of turquoise, purple, lime, lavender, red, gold and orange, joined with orchid thread grid. This is part of Joan's "Melange" collection, a beautiful assortment of colors and designs, a pastiche to wear with style. The border is jet black dyed silk. Medium blue thread joins the the long stripes of bright tomato and purple-tinged red silk stretching the center length of scarf. On one end is a amber gold horizontal piece defining the scattered geometric bits in prints of true blue, lime and lavender, a metallic black/silver thread winds through it all. 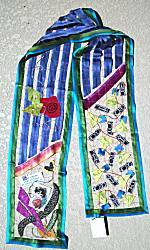 The other end has an apple green horizontal bar defining the bit of glamour girl, printed sign "Not Responsible for Alienation of Affection", butterfly and fabrics in periwinkle purple-blue, plum aqua and orange, a metallic gold thread winds through it all. Hand wash separately in cold water with a mild soap. Roll wet scarf into a towel to get the water out. 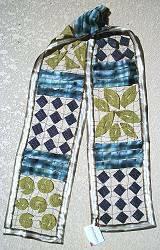 Press damp scarf with iron on “silk” setting. Press straight down trying to avoid ironing side-to-side. Avoid pressing directly on sequins and metallic glitter. The threads holding the pieces together are strong! But dangling earrings can get caught and cats can play too rough! 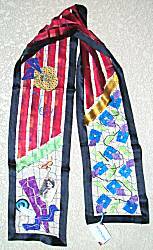 Read about what others think of Joan Edelstein's Arts & Passions scarves! Instead of reviews for a specific product, this is a place to share about the designer line in general.